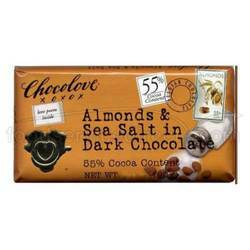 Dark semi-sweet Belgian chocolate, whole dry roasted almonds and sea salt - 55% Cocoa. The number 1 selling bar in the country. Crunchy almonds and sea salt crystals make a tantilizing combination.